I thought I’d start with a cake, as you can’t go wrong with a cake. I’ve written books and articles but starting this blog feels different, I’ve been staring at a blank screen for some time now. I feels like I have to share a bit more of myself than I’m used to here and for someone like me who wants everyone to like what she says and be her friend, this comes with a pit of the stomach emptiness and a couple of deep breaths. Here I go. This elderflower cake found its way into my kitchen on a rare sunny Mayday in London. My sister Laura was in town from LA and we decided to spend the day walking. London walking. We walked Hackney, along the canal past the canal boats that people make homes, past some party hippies making fires and smashing back 11am ciders and some tidy living canal folk who live in miniature on the neatly painted super tidy boats tending to their perfect mini gardens. We walked all the way down the canal, all the time the cotton trees shedding their white floaty blooms into the air and being lit up like fireflies by the May sun. We walked up through the marshes to Walthamstow past wild garlic, cow parsley and the very first elderflowers. The smell in the air was sweet and heady of flowers and spring and promise of sun. It’s the time I get most excited when spring is trying to tell you it’s all ok and that warm days are ahead and the deep London grey of winter has left for now. Though spring can be a liar if you live where we live. London walking for me and Laura is always peppered with a few pitstops. This time at a cafe on the canal where we sat and drank a coffee and then we stopped by at a groaning elderflower bush to pick the blooms. Elderflowers are divas, they will only taste good if you follow their rules. They need to be picked when the sun is shining, and you should only pick the heads that are facing the sun. Where I live in Hackney Elderflowers fill the bushes between late may and early June. The blooms themselves are astoundingly beautiful a galaxy of tiny pale star like flowers. The arrival of the elderflowers heralds the end of the cold and the start of the long days and the knowledge that sandals and spritzes aren’t far away. Mostly I make cordial with the flowers which keeps the sharp hazy floweryness of spring going all year, They make a killer kind of champagne too. I also the tiny stary flowers into jars and cover them with spirits to and they infuse, gin works really well. I toss them into salads and onto grilled vegetable too. 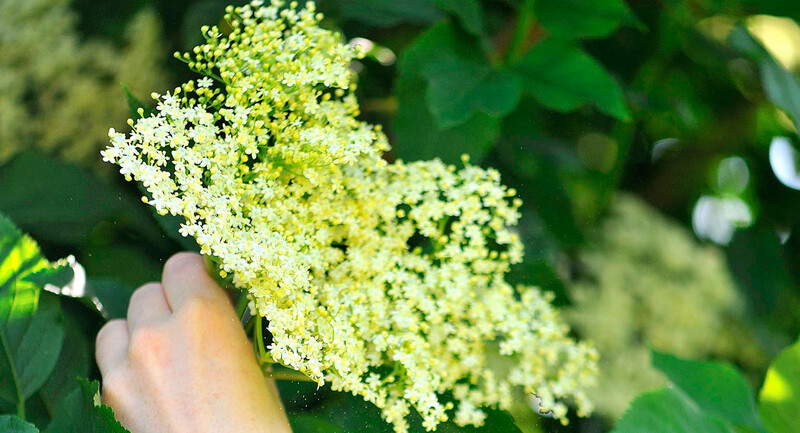 Elderflowers are one of our most amazing botanical secrets and have been used as medicine the world over because of their antiseptic and anti-inflammatory properties. Elderflowers were traditionally used to fight coughs and colds as well as to help dextoxify the body. Elderflowers can help with digestion and is even said to alleviate some allergies. Elderflower is also said to reduce blood sugar levels (cordial has a lot of added sugar though so raw flowers in salads or supplements work best). But most of all they are a flavour all of their own, heady, grassy and lemony and for a couple of month of the year they surround us. This cake though can me made year round with shop brought elderflower cordial. Instead of flour I use pistachios and polenta, which gives the cake a dense baklava feeling. You really need a food processor to grind the pistachios up, so if you don’t have one, use ground almonds instead. One friend said she was going to name her firstborn after this cake. I am not sure there could be higher praise. Preheat your oven to 200°C/fan 180°C/gas 6. Grease and line the base of a 20cm springform cake tin. Put the butter, yoghurt and sugar into a bowl and cream together until light and fluffy. Now blitz the pistachios to dust in a food processor – don’t blitz them too much, though, or they will turn to butter. Add the blitzed pistachios, polenta, baking powder and lemon zest and juice to the butter mixture and mix well. Then crack in the eggs, one by one, and mix in. Pour into the cake tin and bake for 45–50 minutes, until a skewer comes out clean. Remove from the oven and leave to cool in the tin. Make a few holes in the warm cake with a skewer, then gently pour the elderflower cordial slowly over the cake, allowing it time to seep in. Leave the cake in the tin until cool enough to transfer to a cooling rack. For the icing, mix the yoghurt, icing sugar or honey and elderflower cordial until smooth. Spread over the cooled cake and top with the pistachios. Elderflower champagne can be made by 6 year olds and I have done it! Its rllaey only Elderflower Fozz but lovely!2 handfuls of elderflowwers no stalks or 4 if you are 6!Bucket of cold water1 chopped up lemon500gm of white sugar.Put in bucket & stir.Put on lid or tintray or cloth.Stir every time you pass.Next day strain through pillow case or very fine nylon sieve into rinsed plastic cola or lemonade bottles and screw on lids.Leave for 1 week.Pour and enjoy.My little ones like to put blackcurrant juice in glass before adding fizz.#Honest I make this every year with my kids and it goes evry time. We do not have golden icing sugar in the US, at least not that I am aware of. Would confectioners sugar work? Thanks!! Absolutely Marsha, confectioner’s sugar will work fine. In your cookbook a modern way to eat what can i replace the banana in the chocolate cloud cake with please? Hello, this looks amazing! I have the ingredients and excited to make this. However is it polenta or polenta flour?! The flour is obviously a lot finer?! What I’d probably do is make it ahead and freeze it. Otherwise I’d say 2 days before is the max really, you want to keep it as fresh as possible. I love the flavour of this cake. How fine should you be going with the pistachios, I was scared of over grinding them but the texture was perhaps a bit grainy. Should I have ground them more? Such a beautiful recipe, I absolutely love this flavour combination. Can’t wait to try it at home! Can I use elderflowers, and how much? or do I need to make it into a cordial first? (if so do you have a recipe?) thank you! Will the icing melt? Have to travel with the cake and don’t want it to melt. I second Hannah’s comment. By 45 mins the edges were burning. I turned the oven down to 180 and left it in for 15 more mins but had to take it out before it really burned. The centre is still a little soggy. Any suggestions? I’ve just bought your two books and I know it says you can sub eggs for chia eggs in all baking but I also notice that some recipes mention it but most others don’t.. does that mean I should really use eggs for this recipe..? This maybe really stupid, are you supposed to cook the polenta first? I’ve just made the cake and it’s quite grainy…I’ve never used polenta with anything or ever eaten/cooked it before so I have no idea! Elderflowers are from the Gods. So happy to have stumbled upon your recipe. I’m making the cake this weekend for a party! I am wondering…I have a roll of pre-cooked polenta. Could I use this or should I get uncooked? I am guessing the cordial should be diluted …I have bottle green cordial, 500ml makes 5.5 l. I am going to make the cake today and will go with that!! Absolutely love this recipe. It’s SO good I could have it everyday! Such a great cake, so much nicer than a classic chocolate cake. ‘Never going back’ to a normal chocolate cake!! PS love you cookbook, I’m currently going though each page, step by step!